On October 23rd 2015, the Research Centres for Photonics and Instrumentation and Biomedical Engineering hosted a joint workshop with the Centre of Excellence in Nanoscale Biophotonics (CNBP). 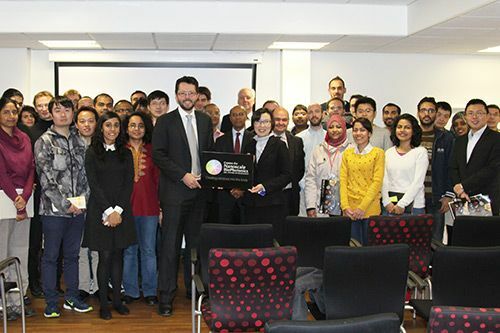 City University London's Research Centres of Photonics & Instrumentation and Biomedical Engineering successfully hosted a joint workshop with the Centre of Excellence in Nanoscale Biophotonics (CNBP) on 23rd October. The event took place in the Convocation Suite of the Centenary Building. 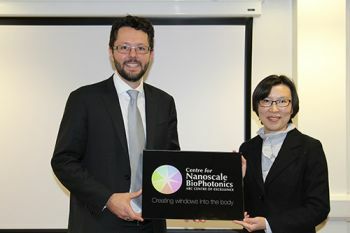 Funded by the Australian Research Council, the CNBP is a collaborative program whose research is focussed within nodes at the University of Adelaide, Macquarie University and RMIT University. The CNBP is a transdisciplinary centre which brings together leading Australian researchers with partners in Europe, the US, China as well as strategic partners within industry. City is one of the CNBP’s key European partners. Biophotonics is the study of the interaction of light with biological material, where “light” includes all forms of radiant energy whose quantum unit is the photon. A more recent development of photonics, much of biophotonics is focused on translating discoveries in the sciences around lasers, light and imaging into useful medical tools.